1. 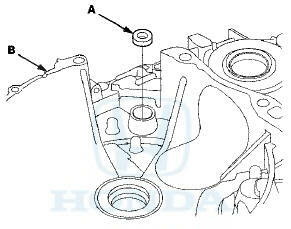 Remove the oil seal (A) from the torque converter housing (B). 2. Install a new oil seal (A) in the torque converter housing to a depth (B) of 0.5-1.5 mm (0.02-0.06 in) below the torque converter housing surface using the driver handle and the oil seal driver attachment.